So that bag of Berroco Remix I bought along with Wendy Bernard's book Custom Knits, to knit the Ingenue pullover sweater with, after multiple swatches and much Ravelry research, is now being knit into the Beatnik pullover sweater. All of my swatching was suggesting that this wasn't the yarn for an Ingenue; getting to gauge would have made a very stiff fabric and I didn't want to have to redesign the sweater to suit my gauge instead. Just going ahead and designing a sweater for myself gripped me for long enough to sit down with Sweater 101 and take notes, and then Beatnik popped up in Friends Favorites on Ravelry and I was smitten. Although I know swatches lie, my swatches suggest I knit this one size smaller (the 40" instead of the 44"), so that's what I'm doing...even though the sweater is knit flat, in pieces, so trying it on as I go won't be an easy option. 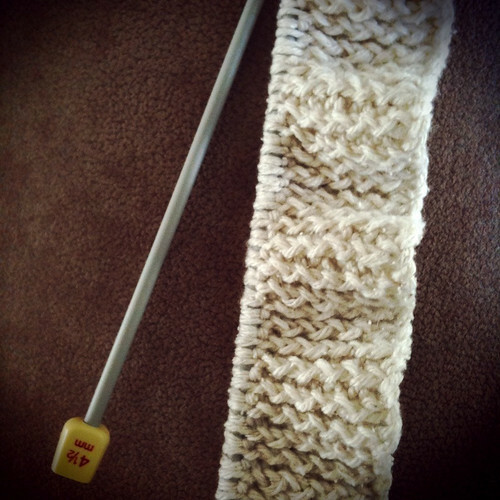 I'm also using 4.5 mm needles to knit the twisted rib hems, because I couldn't find 4.25 mm needles. So far, those are the only changes I have made to the pattern; once I get to the armscyes and sleeves it may be a different story, as I have broad shoulders and big upper arms. I will note that knitting twisted rib in a non-stretchy yarn is not the most fun thing, especially when the needles are heavy enough to slide right out of the stitches if I'm not careful. Added bonus for me preferring to knit "combination" style, which means that the standard instructions for how to knit a twisted rib does not result in a twisted rib when I do it. It's been a little slower for me because I had to pay attention to the stitches and make sure I was twisting them.